Assessment of the future water resources in the Italian Alps under climate change is required, but the hydrological cycle of the high-altitude catchments therein is poorly studied and little understood. Hydrological monitoring and modeling in the Alps is difficult, given the lack of first hand, site specific data. Here, we present a method to model the hydrological cycle of poorly monitored high-altitude catchments in the Alps, and to project forward water resources availability under climate change. Our method builds on extensive experience recently and includes (i) gathering data of climate, of cryospheric variables, and of hydrological fluxes sparsely available; (ii) robust physically based glacio-hydrological modeling; and (iii) using glacio-hydrological projections from GCM models. We apply the method in the Mallero River, in the central (Retiche) Alps of Italy. The Mallero river covers 321 km2, with altitude between 310 and 4015 m a.s.l., and it has 27 km2 of ice cover. The glaciers included in the catchment underwent large mass loss recently, thus Mallero is largely paradigmatic of the present situation of Alpine rivers. We set up a spatially explicit glacio-hydrological model, describing the cryospheric evolution and the hydrology of the area during a control run CR, from 1981 to 2007. We then gather climate projections until 2100 from three Global Climate Models of the IPCC AR5 under RCP2.6, RCP4.5, and RCP8.5. We project forward flow statistics, flow components (rainfall, snow melt, ice melt), ice cover, and volume for two reference decades, namely 2045–2054 and 2090–2099. We foresee reduction of the ice bodies from − 62 to − 98% in volume (year 2100 vs year 1981), and subsequent large reduction of ice melt contribution to stream flows (from − 61 to − 88%, 2100 vs CR). Snow melt, now covering 47% of the stream flows yearly, would also be largely reduced (from − 19 to − 56%, 2100 vs CR). The stream flows will decrease on average at 2100 (from + 1 to − 25%, with − 7%), with potential for increased flows during fall, and winter, and large decrease in summer. Our results provide a tool for consistent modeling of the cryospheric, and hydrologic behavior, and can be used for further investigation of the high-altitude catchments in the Alps. 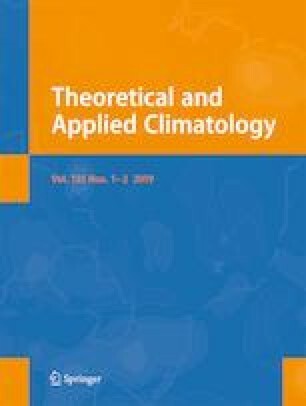 This work takes advantage from climate data kindly provided by ARPA (Regional Agency for the Environmental Protection) Lombardia, which the authors kindly acknowledge. Ice cover mapping was pursued within a non-onerous agreement between the ITT Department of Lombardia Region, and personnel of University Milano. Geoportale Regione Lombardia is acknowledged for providing ice cover maps for some years (produced by Servizio Glaciologico Lombardo SGL, and CNR IREA). Sanpellegrino SpA Company (brand Levissima) supported the research activity through university grants.